These little pumpkins are too cute - they are from My Creative Time's Treats For My Sweet stamp set. The sentiment and Spider with web are from the same stamp set. It's another scrappy sketch challenge with Graphicat Sketches. For challenge #19 I used a Graphicat Design sentiment. Hope you are able to play along with Graphicat Sketch Challenge #19. Do you have any Halloween parties planned for the weekend? 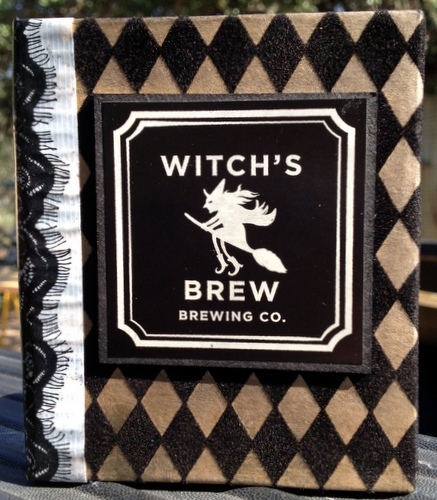 We are gearing up for cooler weather (finally) and look forward to a relaxing, party free weekend. 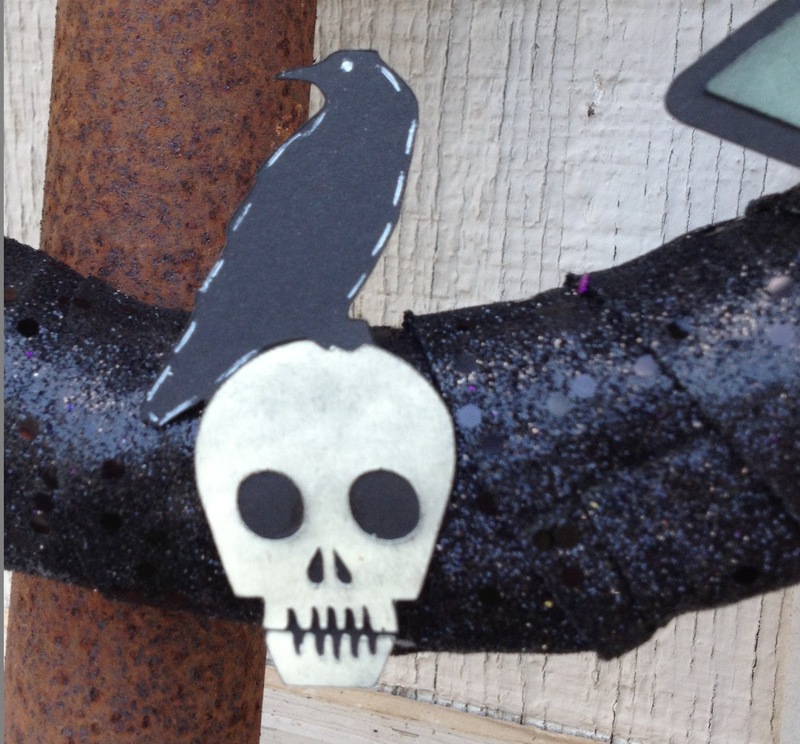 Using Cricut Cartridge A Frightful Affair, I created this Halloween wreath for our door. For the banner I used Halloween twine from Bella Creationz, American Craft thickers and My Creative Time Build A Banner dies. 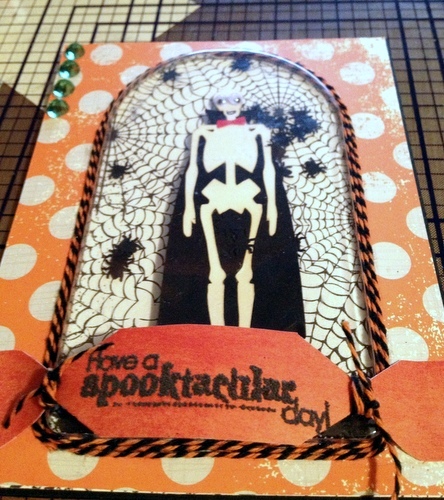 The spider and web are from My Creative Time Treats for My Sweets. Hope you enjoyed and thank you visiting. Graphicat Sketches Challenge #18 is going strong. You still have time to get your entry in for this sketch challenge. All pattern paper is from Authentique 6x6 bundles: Gathering and Blissful. Ribbon is from my own stash. The flowers were created using My Creative Time Rolled Flower Dies and Teeny Tag Greetings for the sentiment. The bling and pearls are from Colorbox and the image is from Saturated Canary Butterfly Baby colored with copics. 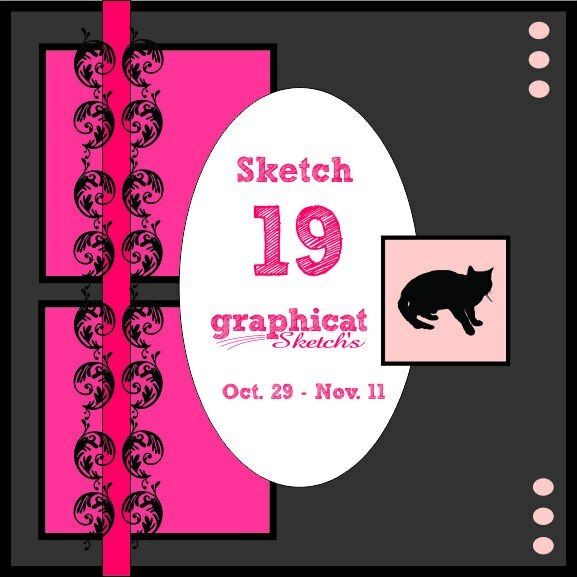 I hope you are able to join us at Graphicat Sketches for challenge #18. Good Luck! The weather this morning is awesome, it is a cool breezy 48 degrees Fahrenheit in the great state of Texas. 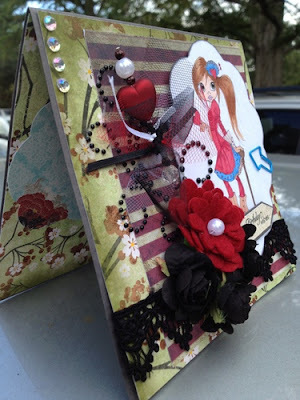 Recently I participated in a tag swap hosted by Stephanie at With A Grin. If you ever need a little inspiration for a mini album, Stephanie is the Queen of Mini's! She is a PRO with mini album's and she can match and accessories a mini album better than anyone I know. 4) mail images to Steff at With A Grin, she will sort and return swapped tags. Tag #1 I sprayed each tag with Ranger Dylusions Ink Spray Squeezed Oange by Dyan Reaveley then using Staz-On Jet Black, stamped the image from Tim Holtz 2012 Mini Halloween stamp set. 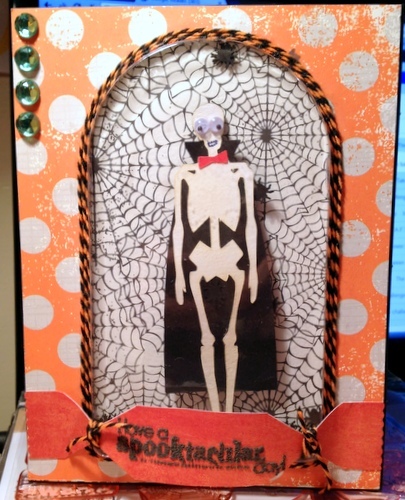 Next I added Tim Holtz mini paper clip and Studio G brad with Halloween twine from Bella Creationz. Tag #2 I stamped each tag with My Creative Time Christmas House stamp set with Staz-On jet black ink. 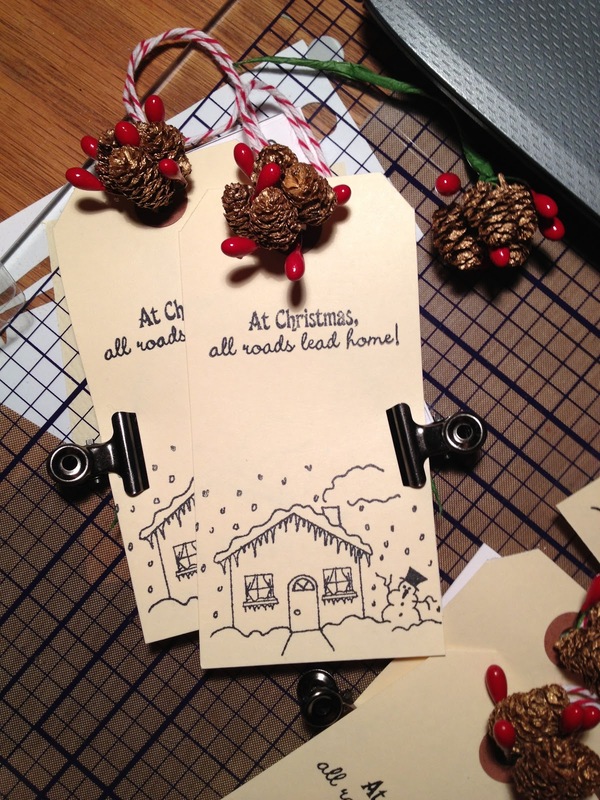 Next I attached a little Christmas embellishment and Tim Holtz hinge clips. I love swapping tags and Steff at With A Grin does a fabulous job hosting. 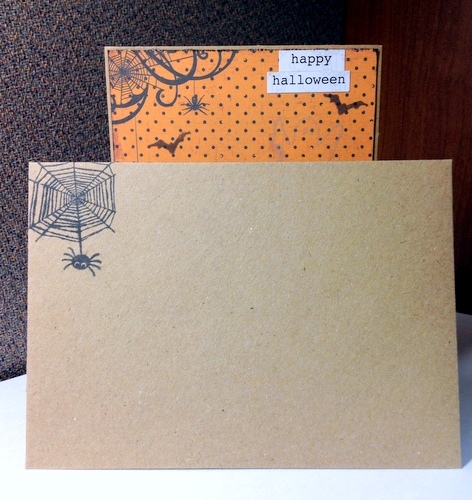 Mid-October and finally making my first Halloween card. October has hoped on the express train and fast approaching November. 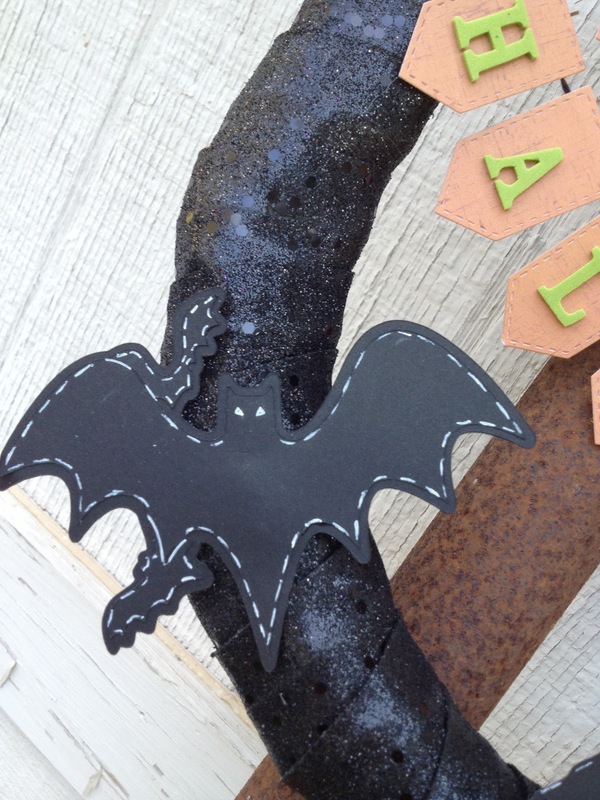 I have a few Halloween crafts to make for the kiddos school festival next week so you will get to see a few more Halloween crafts. 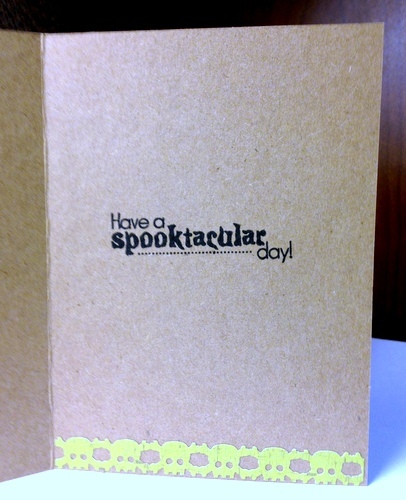 For this card, I started with Cricut Cartridge A Frightful Affair skeleton on page 41; cut at 4 1/4" and added googly eyes. I really like the web paper from Echo Park Apothecary Collection from last year, so I decided to add some little spiders punched from black card stock. I have had the plastic packaging for a while and finally but it to good use. From a window so if you give the card a little shake and the spiders roam around. Wrap the twine from Bella Creationz around the up-cycled packaging and add the bling for a little color. 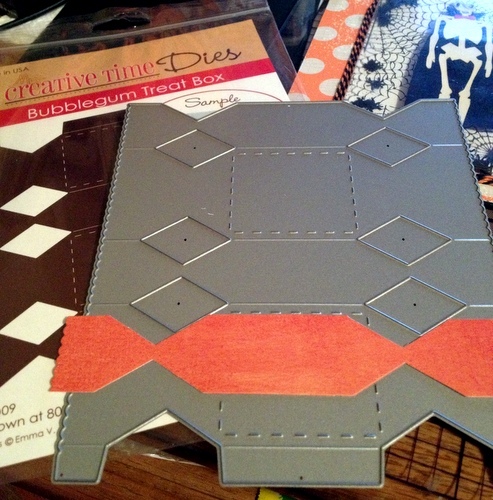 Cutting orange paper with My Creative Time's Bubblegum Treat Box die for the label, I then embossed a sentiment from My Creative Time's Treats For My Sweet stamp set. Wrap more Halloween twine and voila! 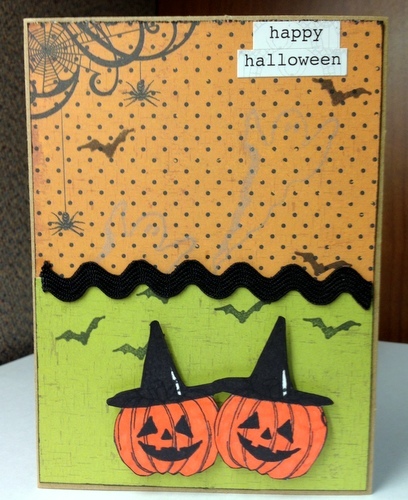 A fun and easy Halloween card! What a fabulous day to celebrate your 40th Birthday! Hope you enjoy your little Birthday Hop for your 40th! May all your wishes come true! Have a fabulous weekend! 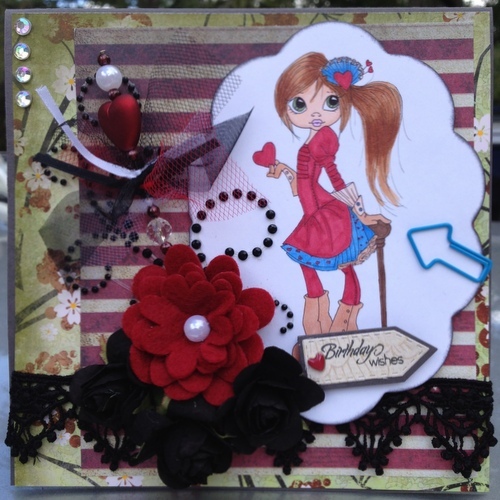 Saturated Canary's Queen of Hearts (I thought) is the perfect image to help celebrate your day! Now off you go to have a royal birthday hop....CHRIS! Good morning and welcome to another challenge Monday with Graphicat Sketches. First, congratulations to sketch #16 challenge winner...Minnie. 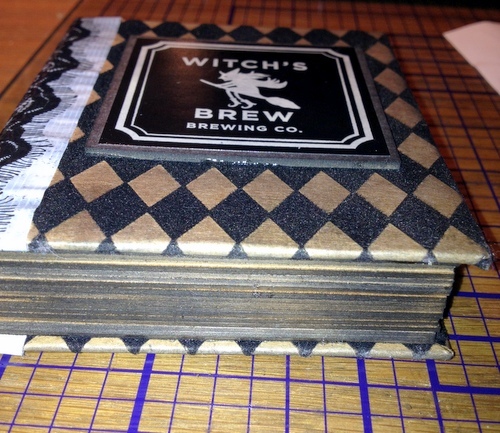 This week I paired a Graphicat Design sentiment with Graphic 45 Magic of Oz paper collection. 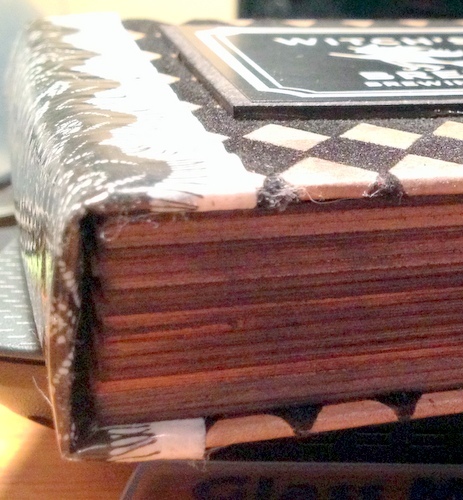 I have hoarded this collection and a few other Graphic 45 collections for too long. I am trying to refrain from buying more paper until I have used more of my stash. The little stocking feet image is Hampton Art Graphic 45 stamp image colored with copics. Button embellishments are Martha Stewart, rose ribbon is Maya Road and the black lace ribbon is from my own stash. 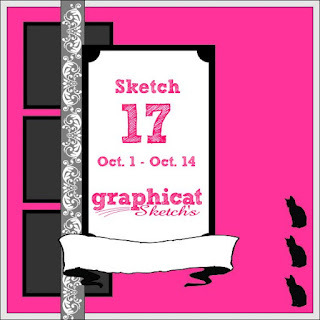 I really hope you are able to play along with Graphicat Sketches - sketch #17 challenge. Now on to the winner from my little giveaway...Congratulations to Renea Harrison! Please send me your mailing information and I'll get your winnings in the mail asap!